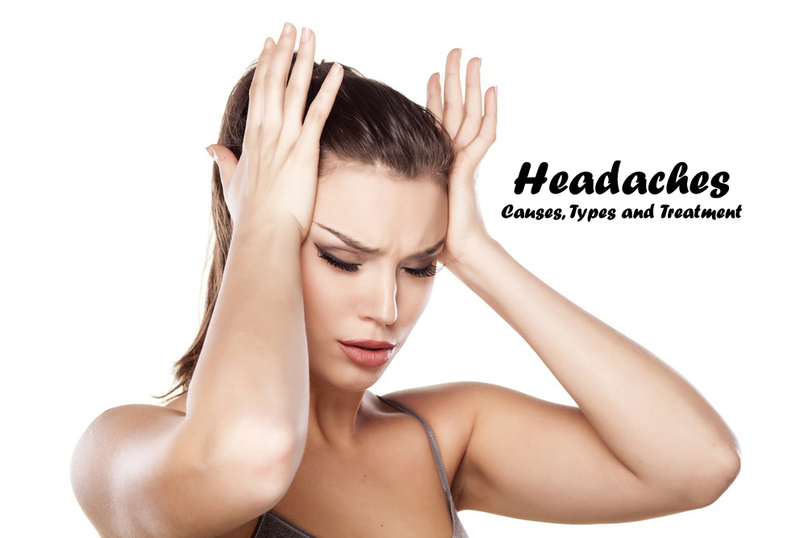 Headaches: Causes, Types and Treatment. Headac hes are the most notorious of all human afflictions. They are ruthlessly non-sparing, and it’s rare to find a man who has never suffered one. Many diverse conditions can split, throb or nag the head, and the list includes vascular disturbances, injuries, infections, intoxicants, hormonal upsets, tumours, and internal organ disorders. Fortunately, in nine cases out of ten, headaches are a result of an uneasy and tense mind. Next prevalent in frequency is the migraine. More frequent in women, it leads to pounding arteries and a throbbing head. Close on the heels of migraines follow cluster headaches that are common in men and occur at night. Then there is a large and assorted group of conditions that present with a headache. In general, physicians today prefer to follow a safe course and put you through a battery of diagnostic tests to find if the pain is due to a physical cause. Usually the tests draw a blank, but they help rule out conditions of a serious nature. In case you have already been through the diagnostic drill with a zero result, here are some helpful hints. Many people pull their head under the covers when they sleep. It is a habit you can do without. Because if you sleep like a turtle you receive less oxygen and that can give you a splitting headache. If it is the creepy crawlies that bug you, use an insect-repellant. But do not suffocate yourself. Are you forced to spend long hours in a place which is stuffy and filled with smoke? Do your friends, colleagues and visitors light a cigarette once too often? If yes, the swirling tobacco smoke can give you a headache because it changes the chemical nature of the air you are breathing. Cigarette smoke builds up the carbon monoxide, ammonia and benzopyrene contents in air toxic levels. The remedy is simple. Either refuse do not allow the nicotine lovers to light up in your room or simply walk out. Even if your office is a ‘no smoking zone,’ you may still run into trouble if it is badly ventilated. An unaired room with a low oxygen level can make you uneasy, set your head throbbing, and impair your concentration. This threat particularly lurks in modern- day offices with sealed windows and central air conditioning that are subject to frequent power cuts. Windows that can be opened easily and the airing of the rooms are a must in this situation. Architects and builders should ensure such provisions. Six to eight hours sleep each night is an excellent recipe for good health. But some people do even better. They sleep off a headache. You can try it too. It works—on most occasions. This also applies to sleep. Extra hours of sleep can leave you with a heavy head. You let go of precious hours and feel miserable. Exercise is a wonderful antidote. It acts as an excellent stress-buster. A forty-five minute brisk walk, five times a week, can work absolute wonders for you. Try it. Take a forty minute quick walk every day and feel the big difference. It works. Deep breathing is a great tension-reliever. You are doing it right if your stomach is moving more than your chest. The lack of food is another head-buster. If you skip or delay meals it causes an automatic drop in your blood sugar and may result in a splitting headache. If you are prone to such attacks, beat them with frequent small meals and snacks, especially fresh fruit, salad and yoghurt. Bright light—be it from the sun, television or a video display terminal—can lead to squinting, eyestrain, and finally a headache. Wear sunglasses if you are going to be out in the sun for a long time. And if you are working on the computer take frequent short breaks. Allow the eyes a moment of rest by looking away from the screen every now and then. Look into the distance or simply close your eyes. It is good for your health in general and head in particular. It allows you to escape traffic snarls and frayed tempers, but more importantly, you save yourself from high levels of carbon monoxide which causes headaches. Excessive noise is a common trigger for tension headaches and migraines. Avoid late night jagrans, disco-dandiyas, ear-splitting music and dance parties. Many people land up in a severe headache simply because they stay up late at night. Watching a late-night movie, playing rummy or painting the town red may not seem such a good idea at the end of the day. Alcoholic beverages can cause severe headaches. Restrict yourself to a small amount and it probably will not hurt. If you hit your head on the rocks, do not take aspirin. It can irritate your booze-inflammed stomach and cause serious problems. Try a cold shower, instead. It may help by constricting the swollen blood vessels in your head. Overwork and fatigue are two common culprits that can give you a dull ache or a full-blown migraine. Watch out and do not overstep your limits. Not just on your body, but on your mind too. Never nurture unrealistic expectations and you will breathe so much easier. Laughter is the best medicine. This fact applies equally well to pains and aches. You can, quite often, laugh a headache away. If you experience tension headaches frequently, it is time you went to a yoga teacher or a psychotherapist, learnt relaxation exercises, and did them regularly. Some people are weather-sensitive. They experience headaches and other unpleasant reactions if the weather and atmospheric conditions change. A big swing in any of the meteorological factors—relative humidity, air temperature, force and direction of the wind, and cloudiness—leaves them indisposed. They are knocked off their feet with a headache, an inexplicable low feeling, sleep problems, reduced working capacity, alteration in the mood, and, sometimes, pain in the joints. If you suffer from such super-sensitivity to the vagaries of the weather gods, do not despair. You have no control over the weather, but you can avoid the splitting headaches by following a few simple rules. Lead an active life and stay out in the open as much as possible. Do plenty of exercises. If none of this works, take a sedative, or an analgesic pill, just as the weather shows the first signs of change. For those who suffer from pronounced weather reactions, it is best to rest and relax till the weather gods relent. Oxygen levels get rarefied at high altitudes. This can give even a robust and healthy person a headache. In order to avoid this, take rest and go easy on the first few days. The body needs a few days to acclimatise. In case you opt for a paracetamol or some other painkiller, take it right away— as soon as you suffer the first symptoms. Otherwise, it will not do much good. Never get into the habit of popping a painkiller every now and then. It is risky. Analgesic abuse has destroyed many kidneys and livers and claimed many lives. Wear a headband. This age-old home remedy has merit to it. It decreases the blood flow to the scalp, lessens the throb and pain, and is an easy and practical device. Some women suffer from a premenstrual headache. This is due to the natural hormonal changes taking place around this period. If this is the trouble with you increase your daily intake of vitamin B6 to at least 2.5 mg. Take plenty of green vegetables, legumes, whole cereals and milk. Relief can sometimes come that easy. You sure could take an eye test. Optical errors of the eye are a potent cause of eyestrain and headache. You should exclude this possibility. Inflammation of the sinuses is more common than you may be inclined to believe. So, in case you experience a recurrent pain in the forehead, cheek and nasal areas that gets worse on stooping and jarring of the head, think of it as a possible sign of sinusitis. Let an ENT doctor check it out. Occasionally, it is a headache that calls attention to a high blood pressure. Limited mostly to the more severe cases where the diastolic pressure shoots up to 110 points or more, the characteristic feature of this headache is that it occurs in the early morning and affects the back portion of the head. It is a kind of an alarm bell, which continues to ring for some hours, then stops. Do not ignore this warning sign. Spondylosis of the neck vertebrae can also lead to pain in the occipital region. This happens because the bony spurs pinch the nerve roots. Maintaining your neck in good health by keeping proper posture ans strengthening the neck muscles through a regular exercise programme is the best way out. For more details, refer to section Neck Pain. • You are above forty and never had recurring headaches before. • The headaches have changed in nature—they are getting stronger, occur more frequently or have changed location. • The headaches have begun to disrupt your life. You cannot sleep or have missed work on several occasions. • The headaches are accompanied by suspicious symptoms such as nausea, dizziness, blurred vision or memory loss. If you observe any of these symptoms, see a doctor. He would talk to you in detail, examine you thoroughly and may ask for a CT scan or MRI of the head. That can help identify if there is a physical reason for the headache, and guide the best course of treatment in good time.